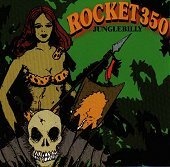 Wild, carnivorous rock with greasy grooves, frenetic slap bass, sizzling guitars, and sweaty vocals, Rocket 350 hammer out psycho-billy mayhem with rock-a-billy basics, punk articulation, and a drunken swagger. Though, caught up in their own party, they tend to dish out the same licks and grooves time in and time out. Junglebilly is a greasy, manic rock-a-billy record from a promising rock-a-billy band; yet, even though this album has strong chops and plenty of energy to burn, they get lost in their own sound. And when this happens, they tend to re-tread what's already been done, giving you a generic sounding rock-a-billy record with the energy level masking the lack of soul and real fuel. "Baby Blue Jeans" is all sweat as the steamy vocals and the scorching guitars burn right to your soul; "Cigarette Girl" makes you want to join the party; and "Burn Out" is as wild an explosive as they come. But, no matter how hard they try or how hard they go at it, they just don't blow you away. Here is a good record to move and shake too, as long as you're not planning to keep the party going with just one album. It's a good listen, but after awhile it burns out quick and sends you scrambling to find something else to keep the coals warm. I'll give it a C-.